Due to our truthful business standards and transparent deals, we are steadily making our way to the platform of success by offering a wide grade variety of Hair Loss Treatment Kit. 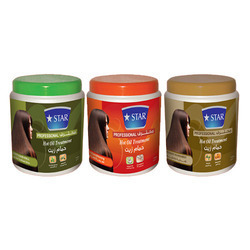 While expanding our reach in the growing retail industry, we are indulged in providing Natural Hair Loss Treatment Kit. The Therapy-G complex of proteins, vitamins and botanicals is formulated to be the most effective treatment and fashion styling for thinning or fine hair. 4 Step System Kit contains Antioxidant Shampoo, Follicle Stimulator, Conditioning Treatment, Hair Volumizing Treatment with Hair Vitamins. This treatment offers a therapeutic remedy that penetrates deep into the damaged hair to reconstruct and rebuild the hair and repair the damage, done by chemical treatments, UV exposure, pollution, dirt. The unique treatment will help bring our hair’s inner health, giving incredible moisture and shine. of hair by strengthening its roots, improve hair volume. The VLCC Scalp Treatment Dandruff Control Kit helps combat flaking, dandruff and dryness of scalp. Antiseptic property of Neem provides remedy for severe dandruff ridden scalp. Brahmi encourages hair growth, adds lustre and makes hair beautiful, bouncy & tangle-free. Hair Regrowth Treatment is hair regrowth treatment which helps in getting back your lost hair. · It hydrates the hair roots.